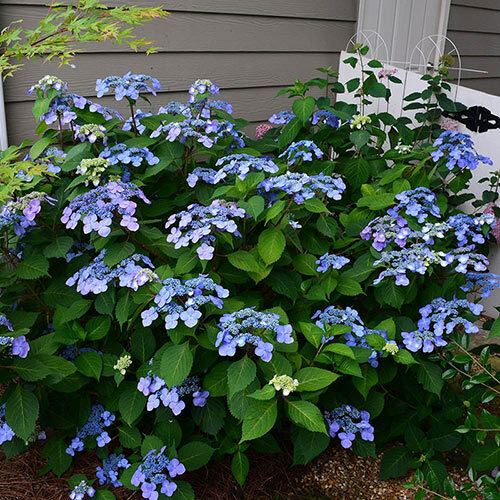 Enjoy hydrangea blooms for months with this compact, reblooming shrub. Its elegant lacecap flower heads bloom on both old and new wood, so you'll see flowers from spring to summer. The flowers are pink alkaline soil, and blue in acidic soil. The blooms are pretty in the garden and landscape, and stunning in cut-flower arrangements. The attractive foliage turns burgundy in the fall. Growing 3-5 ft. tall with a 3-4 ft. spread, this shrub is easy to fit into gardens, landscapes and even containers. Performs best when planted in partial shade. Zones 4-9. LightBest in partial shade from Zone 7 south. 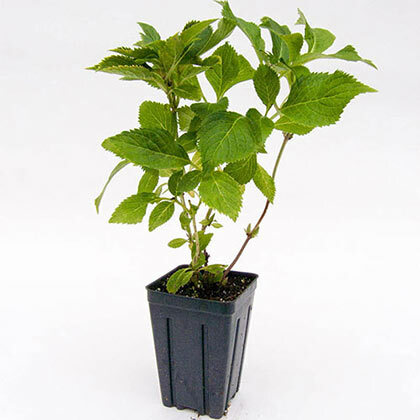 Plant them in a sheltered location in shade or partial sun. 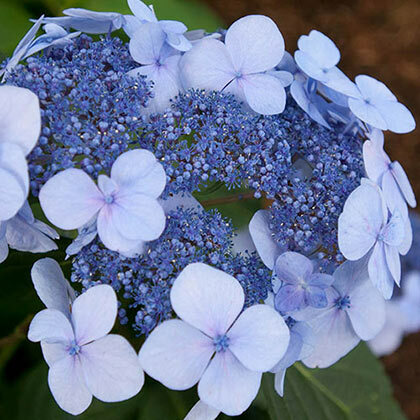 Hydrangeas need protection from heat and scorching sun. Flower FormFlower cluster has a lacy center of tiny, fertile budlike flowers surrounded by a rim of larger, non-fertile flowers, each with four petals. BloomsReblooms from May to September on both old and new wood. PruningPrune off spent flowers, as they occur, throughout the season. Because it blooms on both old and new wood, you can prune the shrub to size and shape any time the plant is actively growing. CommentsThe first available reblooming big leaf lace-cap type Hydrangea, reblooms from May to September on both old and new wood. A strong grower with red-burgundy fall leaves and red stems-a striking combination! Best in partial shade from Zone 7 south. Shrub matures at 3-5' tall. Potted. Zones 6-9.